Worksheets, examples, and solutions to help Grade 2 students learn how to describe two-dimensional shapes based on attributes. 1. Identify the number of sides and angles for each shape. Circle each angle as you count. The first one has been done for you. 2. Study the shapes below. Then answer the questions. a. Which shape has the most angles? b. Which shape has 4 more angles than shape F? c. What shape has 5 fewer sides than shape D? d. How many more angles does shape A have than shape B? 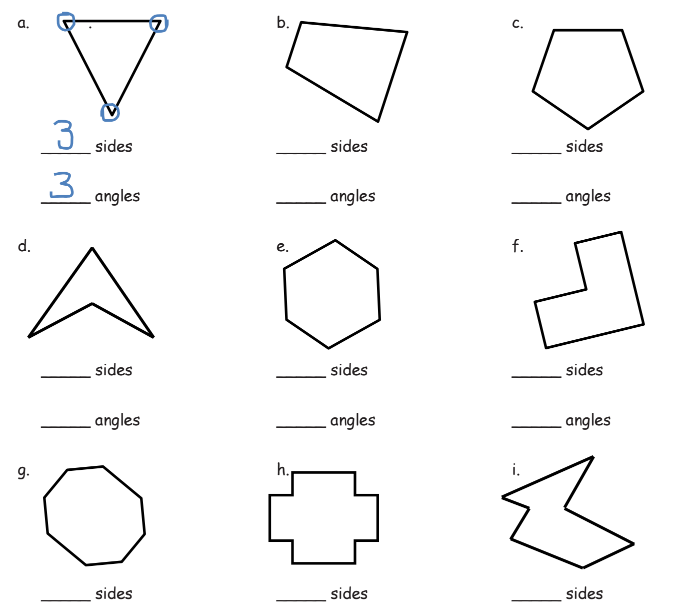 e. Which of these shapes have the same number of sides as angles? 3. Joseph’s teacher said to make shapes with 6 sides and 6 angles on his geoboard. Shade the shapes that share these attributes, and circle the shape that does not belong. Explain why it does not belong.